Victorious (CD Preview Pack) composed by David Moffitt. Arranged by Cliff Duren. For SATB choir. Benson Choral. Praise & Worship, Easter, Musical. Moderate. Book & CD. Duration 45 minutes or 25 minutes. Published by Brentwood-Benson Music Publishing (BN.4575721701).Victorious, a new, and distinctively Easter presentation for Modern Worship Choir, created by David Moffitt and arranged by Cliff Duren, is a contemporary worship choral collection combining familiar Easter-themed songs of worship in concert with new, modern-worship songs composed by worship leaders and songwriters Jonathan Lee, Carl Cartee and David Moffitt, to name a few.This remarkable Choral Resource for Easter offers songs that can be used throughout the Easter season and beyond, making it an invaluable and flexible tool, appropriate both for Easter and throughout the year. This Easter-centric, 45-minute modern-worship choir collection is easily adaptable to both large and small choirs, or for praise teams using either a live worship band or accompaniment tracks. 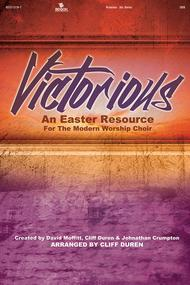 For those churches with limited rehearsal or performance time, this flexible Easter resource has been designed to offer you a 25-minute performance option by ending after the 5th song, Victorious.The array of companion products available for Victorious includes a DVD Media Kit, which offers a high impact visual experience to your presentation of this powerful Easter worship resource.